Sasquatch have traditionally lived off the land of Cascadia. They have hunted, fished and gathered as they've seen fit for many millennia before humans arrived here. Now, because of the activities of humans, Sasquatch are finding it difficult to live in their traditional manner. One of the most controversial issues in Sasquatch-human relations is that of the tree octopus. The Pacific Northwest tree octopus is a traditional game animal of the Olympic Peninsula Sasquatch. Besides providing these Sasquatch with an important source of protein, they also play a role in Sasquatch culture. The gathering of tree octopuses features prominently in Olympic Peninsula Sasquatch traditions, with many rites and observances associated with it. However, tree octopus numbers have become extremely low due to destruction of habitat by humans and it is now considered an endangered species. Because of this, Olympic Peninsula Sasquatch are finding it increasingly difficult to gather enough tree octopuses for their needs, and there is concern among human environmentalists that the activities of these Sasquatch are only going to help lead to the extinction of the Pacific Northwest Tree Octopus. Environmentalists are calling on Sasquatch to give up their traditions - at least temporarily - in order to save the tree octopus. 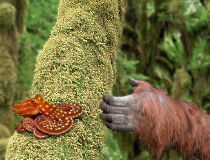 Sasquatch, however, feel that it is the fault of humans that the tree octopus is endangered and that Sasquatch should not have to pay for human mistakes. Environmentalists counter that this is a nearsighted position that will only hurt Sasquatch traditions in the long run, as once the tree octopus is extinct the tradition of gathering them will be extinct too. Sasquatch dismiss this point with a howl and retreat into the forest to gather more tree octopuses. The BSA is working with the Cascadian Bureau of Fish and Mollusks to find a way to solve this problem. One solution that we are implementing is providing Sasquatch with, and encouraging them to adopt, tree octopus substitutes - such as farm-grown aquatic octopus, common commercial-grade squid, and haddock-based synthetic octopus meat - to replace the tree octopus as a protein source. While many Sasquatch welcome this as a dietary supplement - including Sasquatch outside of the Olympic Peninsula who are experiencing other food-availability issues - Sasquatch are still concerned that their traditional tree octopus gathering needs will not be met by tree octopus substitutes. For instance, some Sasquatch cite the way that tree octopus substitutes squirm around in the branches - if they squirm at all - as not being anywhere near as aesthetically pleasing and enticing as the squirming of real tree octopuses. Also there is the fact that the substitutes must be placed in the trees by either Sasquatch or game officials, which most Sasquatch agree takes away from the thrill of the gather and turns the whole affair into a hollow mockery of Sasquatch traditions. These issues will have to be seriously addressed if Sasquatch are to accept any solution to the tree octopus problem. Finding a solution that balances the needs and interests of Sasquatch and environmentalists will be difficult, but such balancing acts have been successfully accomplished in the past: witness the agreement reached with both environmentalists and commercial interests over Sasquatch geoduck harvesting rights. The BSA hopes that by continuing to work with the Sasquatch community, Cascadian wildlife management offices, and the environmentalists that we can move towards a solution that will preserve both the Pacific Northwest tree octopus and the traditions of the Olympic Peninsula Sasquatch.